Interested in Outdoor sessions? We do those too! Session fee includes your photographer’s time and talent, a curated collection of images to choose from and an in-person ordering meeting with a portrait designer. Digitals, prints and products sold separately. 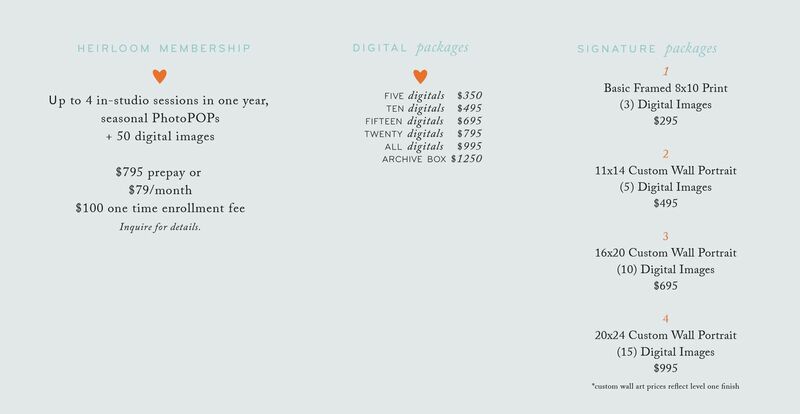 Heirloom Membership includes waived session fee at the time of session booking. Our packages are clear and simple. You choose what works best for you and your family. We are believers in quality over quantity, and take time, care and attention to your imagery.